Fox NewsCongressman Chris Collins speaking to reporters on Wednesday evening in New York. 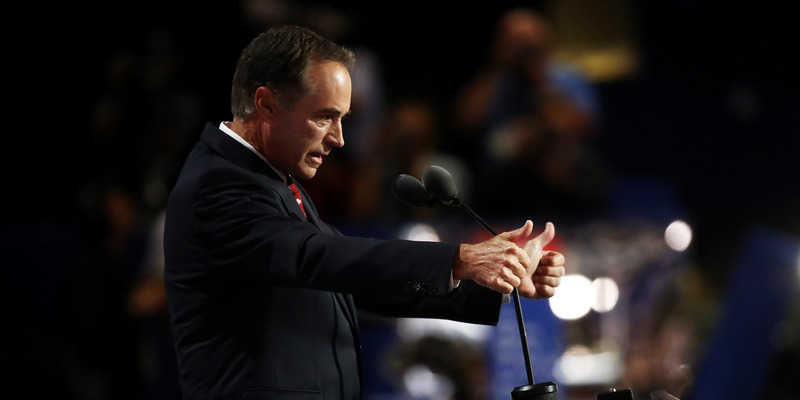 Congressman Chris Collins was arrested yesterday on charges of securities fraud, including a claim of insider trading at a White House picnic. Collins claims the charges are “meritless”, and told a press conference he will stand for re-election in the mid-terms. He represents the 27th District of New York in the House of Representatives. The GOP congressman accused of insider trading has vowed to stand for re-election in November, despite the allegations against him. Chris Collins, who represents the 27th district of New York, was arrested by the FBI on Wednesday and charged with securities fraud, including an allegation that he made an insider trade from a picnic held at the White House. At a press conference on Wednesday night, Collins attacked the allegations against him as “meritless”, and said he would clear his name and run for office again. At the end of a six-minute statement, he told reporters: “I will remain on the ballot running for re-election this November.” He then ended the conference without taking questions. Collins’ district is in western new York, between Buffalo and Rochester, and is generally considered a safe seat for the GOP. His opponent is Democrat Nate McMurray, an attorney and local politician. The allegations against Collins relate to his position on the board of Innate Immunotherapeutics, an Australian pharmaceutical company. Prosecutors in New York allege that Collins tipped off his son to impending bad news, allowing him to sell shares before the market could react. 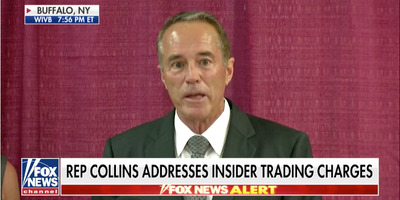 The indictment said that Collins got privileged information – that one of Innate’s drugs had failed a medical trial – while at a White House picnic event for lawmakers on June 22, 2017. Collins allegedly called his son Cameron Collins the same day to alerting him to the bad news, which the market didn’t hear about until June 26. Prosecutors say Cameron then sold more than 1.3 million shares in Innate. The company’s stock price plummeted when the failed trial became public. The indicment says that the advance information saved around $US570,000. The complete charges against Collins are one count of conspiracy to commit securities fraud, seven counts of securities fraud, one count of wire fraud and one count of making false statements to the FBI. Cameron and the father of his fiancée, Stephen Zarsky, were also charged by the FBI. Collins was one of the first congressmen to publicly support Donald Trump and is a long-term ally of the President.